The Calgary Stampede’s Heavy Horse Pull got a mighty push on Thursday evening. The annual Heavy Horse Pull Advertisers’ Auction, which acts as the annual kickoff to the Stampede pull, featured plenty of auctioneer patter and bidder banter at the Victoria Pavilion. And when the dust had settled, a whopping $62,200 had been raised – a dramatic leap from last year’s bottom line of $39,300, and a total that’s believed to be the highest in the 10-year history of the auction. “We had a lot of registered bidders out tonight . . . probably the most we’ve ever had,” said Bill Nelson, chair of the Stampede’s Heavy Horse Pull committee. “And there was really spirited action between bidders, back and forth. A total of 23 teams from as far away as Oregon, Washington, and Saskatchewan have arrived for the Stampede’s “tight-tug” pull that is developing a sterling reputation across the continent — and ranks as the richest horse pull in North America, with the winner receiving a cheque for $3,000. The 2011 Heavy Horse Pull will take over the Big Top for the final three nights of Stampede. The lightweight division gets things underway on Friday, July 15, the middleweights take centre stage on Saturday, July 16, and the gentle giants of the heavyweight division bring the curtain down on Sunday, July 17. Start time all three nights is 7 p.m. 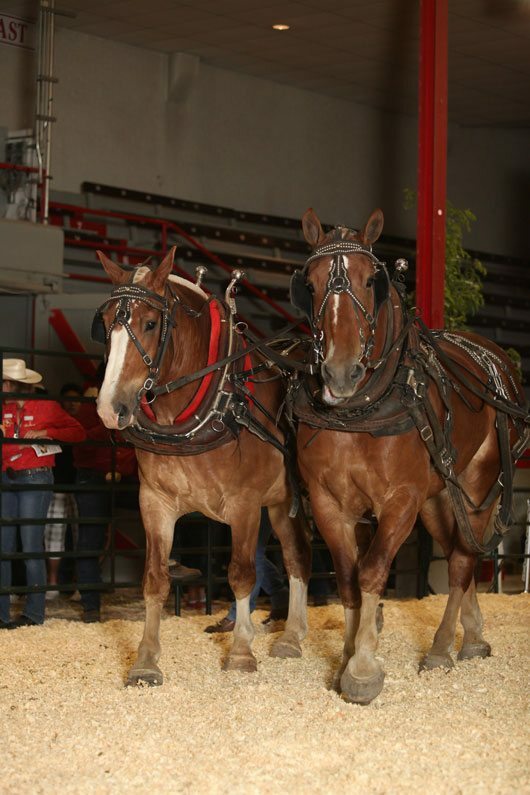 Since it was established in 2002, the Stampede’s Heavy Horse Pull Advertisers’ Auction has become a truly magnetic event for individual and corporate supporters, with attractive and affordable branding possibilities and a unique venue for entertaining clients and employees. For successful bidders, the Heavy Horse Pull advertiser’s package includes passes to watch their teams during competition from a private VIP section under the Big Top, signage on the horses during competition, stall signage in the barns, and an exclusive party in the Victoria Pavilion alongside the horses after the main events. Thursday night, the Springbank Belgians team of heavyweights, owned by Dennis Weinberger of Cochrane, Alta., garnered the top auction bid, $4,700, from the We’ve Got Pull consortium. Stan Grad and the Soderglen Ranches team from Airdrie, Alta., commanded the top bid among middleweights, at $4,200, from Lantz Farms Ltd. And Bob McGowan’s team from Lebanon, Ore., earned the top bid among lightweight outfits, at $2,100, from Lone Wolf Wireline. Also Thursday night, a total of $4,075 was raised for Stephanie Ross, an equestrian rider and 2012 Paralympic hopeful from Vancouver, through the auction of blacksmith art and other items. Last year, Weinberger and his Springbank Belgians outfit made history by winning the triple crown for the first time in Stampede Heavy Horse Pull history — claiming all three divisions. And Weinberger capped his triplicate win in dramatic fashion, as his gargantuan duo of Dan and Jesse set a Stampede heavyweight division record by pulling a 13,200-pound sled the full 14 feet. This year’s teams primarily feature Belgian and Percheron horsepower. Outfits compete in three classes based on the total weight of the two-horse team – lightweights from 2,400 to 3,000 pounds, middleweights from 3,001 to 3,500 pounds, and heavyweights tipping the scales at 3,501 pounds and up.